I can't feel my baby moving very much, is everything OK? Can I have another scan so my husband can see our baby too? I'm bleeding while I'm pregnant, is the baby safe? 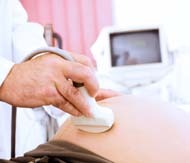 Between 14 weeks and 20 weeks of your pregnancy you can ask for a routine scan that will check the fetal heart beat and measure the head, tummy and leg length of your baby. This scan gives reassurance if you experience bleeding and/or pain or if you just want another chance to see and bond with your baby. have concerns for your baby's well-being at any stage of your pregnancy.